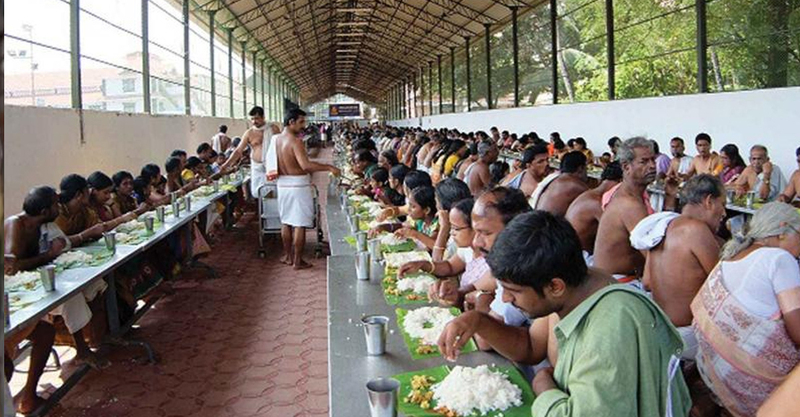 The devaswom board has decided to give entrance to non-Hindus for prasada ootu in Guruvayur temple. Non- hindus can now enter the annalakshmi hall which is situated outside the temple wall. So that non-Hindus can have the feast or prasada ootu from there. Devaswom board also decided to take off the ban on wearing pants, T-shirts, Shirts, and footwear’s while entering the hall. But wearing lungie and using mobile phones are still banned. Before non -hindus were not allowed in the hall and prasada ootu. More seats are provided in the hall as the ‘vaishakham’ started. 400 seats are additionally provided with permanent 416 seats. From morning seven to nine breakfast will be provided and lunch from 10:30 and ends at 1:30pm. Dinner will be provided for one hour after nivedyam.